The Greatest Love of All, a critically acclaimed live concert honouring the talent, music and memory of Whitney Houston featuring the breathtaking vocals of Belinda Davids accompanied by the sensational National Philharmonic Concert Orchestra, is a beautifully crafted homage to one of the world’s most revered singers. A major UK tour of The Greatest Love of All will launch at the world famous London Palladium on Sunday May 19th 2019. A UK tour will follow in October: Birmingham Symphony Hall on Thursday 10 October – Newcastle City Hall (Saturday 12 October) – Glasgow Royal Concert Hall (Sunday 13 October) – Bournemouth Pavilion Theatre (Tuesday 15 October) – Brighton Centre (Friday 18 October) – Liverpool Philharmonic (Sunday 20 October) – and Cardiff St David’s Hall (Monday 21 October). The two-hour production, starring Belinda Davids, winner of BBC One’s Even Better Than The Real Thing, is a heartfelt musical journey through Whitney Houston’s greatest hits including I Will Always Love You, I Wanna Dance With Somebody, How Will I Know, One Moment in Time, I Have Nothing, Run to You, Didn’t We Almost Have It All, Greatest Love of All, I’m Every Woman, Queen of the Night, and many more. Belinda Davids made her British TV debut in 2017 and left viewers stunned by the similarities between the South-African born singer and the late pop diva. She went on to be crowned winner of the Even Better Than The Real Thing and a 9-date tour of major UK theatres followed, culminating in an unforgettable night at London’s Hammersmith Eventim Apollo. 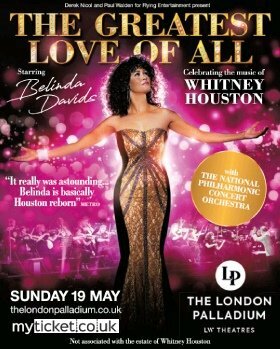 All the media attention in the UK led to an invitation to appear on stage at Harlem’s legendary Apollo Theatre – where Whitney recorded the video for ‘The Greatest Love of All’ – before its famously critical audience. It was an intense and nerve-wracking occasion but her rendition of Whitney’s ‘I Will Always Love You’ received a standing ovation from one of New York’s harshest audiences, and Davids now counts the experience as one of her career highlights. Belinda Davids is no stranger to being the best of the best. In 2012, she auditioned against over 15,000 hopefuls from all over the world to play the part of her idol, Whitney Houston in a new show designed to showcase her incredible legacy. The Greatest Love of All: The Whitney Houston Show opened to critical acclaim and has since toured the globe, wowing audiences across the US, Canada, Europe, South Africa, Asia, UAE, Australia and New Zealand. A lifelong fan of the global superstar, Belinda first heard her voice at the age of 8, on her brother’s LP of ‘Hold Me’ by Whitney Houston and Teddy Pendergrass. She was hooked, and this started a love affair that would last a lifetime, and would eventually lead to her starring role in the show, a dazzling spectacle of pop at its finest. Davids performs over two hours of Houston’s most loved pop hits live on stage. And there is no person better equipped to do so – critics have been blown away with her “jaw-droppingly similar” voice to the pop diva.